Over the course of this two-year course, students will complete at least 30 hours of labs. Most of these will not be graded, but be designed to give you meaningful experience that will either support material learned in class or prepare you for a future in science. Your graded IAs will be worth 20% of your final ESS mark and are the only part of your final grade that you can be sure of before you begin your final exams in May. As such, it is work hard to improve in these to give you a strong foundation at the end of your second year. Your ability to design and control a lab capable of collection sufficient, relevant data. Your ability to organize raw data and use it to draw meaningful results, then graph this as necessary. Your ability to use your processed data to draw meaningful conclusions, explained scientifically and supported by cited research. You are then expected to evaluate your procedure and data, pointing out significant errors and suggesting real-world solutions for each one. Your use of lab techniques, collaboration during experiments, and adherence to safe procedures. For each of these, you can earn up to 6 points based on earning a Complete (2), Partial (1) or Incomplete (0) in each of three Aspects. Earning a Complete often requires a nearly perfect fulfillment of the Aspect, while an Incomplete is difficult to get if you have included all the required parts. Over the course of this two-year class, we will complete many graded labs but only your two best marks in each criterion will count for your final grade. Thus, anywhere between 2 and 6 labs may be selected to represent you in Pl, DCP and DEC.
Research question - Include your IV and DV in the question, with units in brackets. Hypothesis - Include your IV and DV in the hypothesis, as well as a scientific explanation for your expected results using graphs and research (with citations) where appropriate. Variables - Should be presented in a table. You need to choose your IV and DV, and include their units, uncertainties and how they will be measured (equipment or procedural summary). 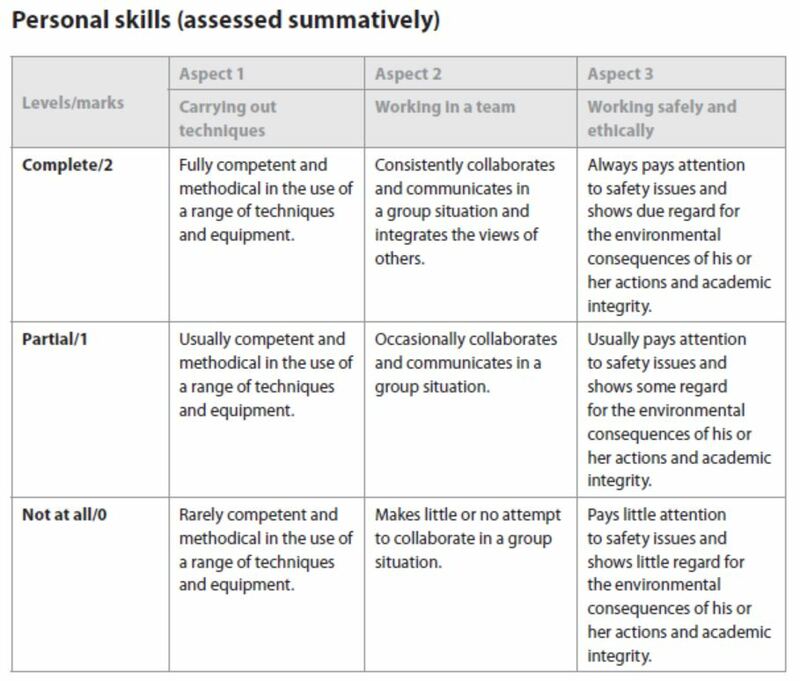 You should also include all relevant CVs with units and uncertainties, along will an explanation of how the variable could affect your results and how this will be controlled or monitored. Equipment/Materials - A bullet pointed list of all the equipment you will use, including their size and brand, and how many/much will be needed. Where relevant, you can also include their uncertainties. Plants or animals should include their binomial species name. Procedure - Should be presented as numbered steps, and include a labelled diagram if useful. It should include how all your variables will be measured or controlled, including all the equipment used. Every CV should be controlled in the Variables and Procedure sections. Your procedure should allow the collection of sufficient, relevant data. In my class, this means that you should have an IV increments of at least 5, and repeat your procedure for 5 full trials. At the end of your procedure, you should include any statistical tests you plan on using (explain why) and address any ethical concerns if needed. how much data to collect. Qualitative primary data - Include observational data of things you have seen, smelled, heard et cetera. Quantitative primary raw data - In a table, organize and present your numerical data from measuring your IV. This should include all units and uncertainties in the headings, with consistent decimal places of equal precision. Tables should have titles including the relevant variables and their units. Secondary data - Data that you have found through research. Data processing - Include sample calculations of all your data processing, along with a brief explanation of why you are manipulating the data this way. Make sure that you do whatever calculations are necessary to determine your DV here. At a minimum, you should calculate a mean and standard deviation, with any relevant statistical tests. See the DP Biology Statistics in Labs guide for more options. 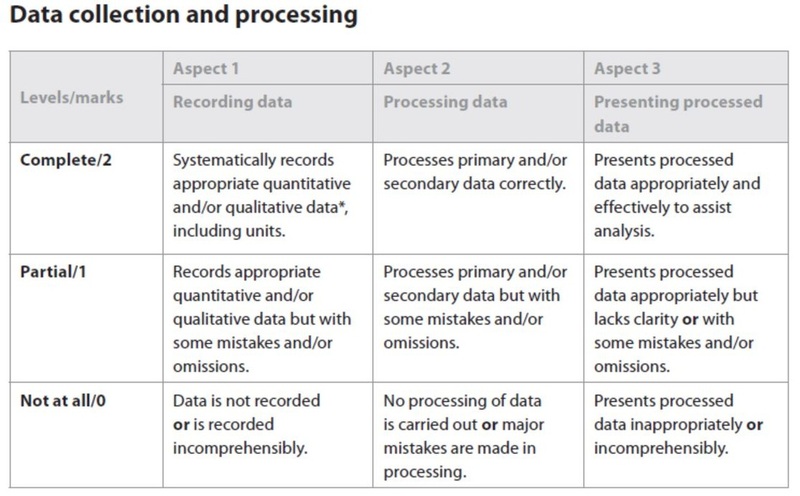 Processed data - Separately from all raw data, present your processed data with appropriate units and uncertainties in the headings, with consistent decimal places and equal precision. Tables should have titles including the relevant variables and their units. Graph - Choose the appropriate graph to present your processed data (never your raw data), including a title and axes labels (the variables and their units with uncertainties). Your graph should also include correct error bars (usually based on your standard deviations) and a line of best fit, where applicable. how to present the data. Discussion - Describe your results, referring to your graphs and data to point out any patterns or abnormalities in the data. Scientifically explain the results you got, with justification, and compare them to published scientific literature when possible. Compare your primary and secondary data, mentioning if they support or contradict each other. Discuss why your data is interesting or important to the real world. Discuss the reliability of your data, making reference to your choice of IV increments, standard deviation and variability of data. You may also talk about your statistical tests. Some mentions of errors may also be appropriate here, as long as they are mentioned again in the Evaluation section. Make sure to discuss any strange data points. 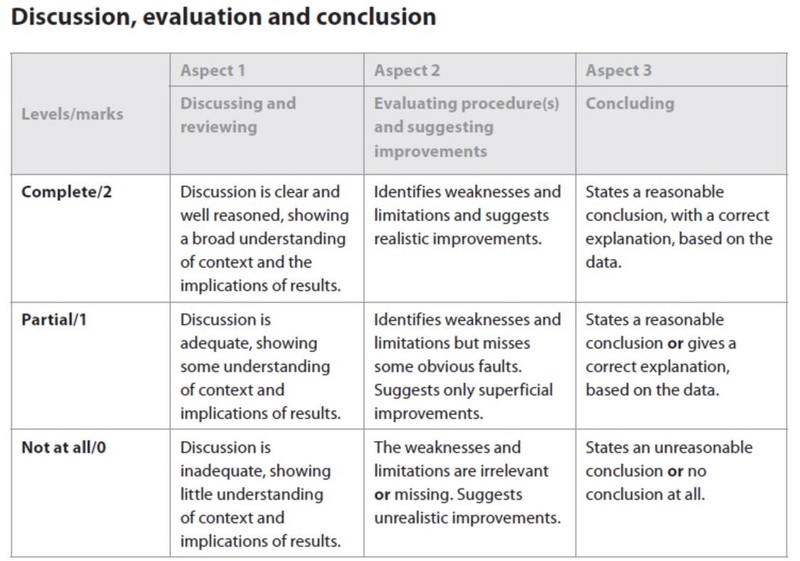 Evaluation - In a table, outline all important errors, stating what type they are (systematic, human or random) and describe how they may have affected your results. These should be mainly systematic errors, with human errors kept to a minimum. In the same table, suggest realistic improvements for every error. Make sure to be specific in describing and explaining how these errors will be addressed, citing research where needed. Conclusion - Restate your research question and discuss whether or not your data supports your original hypothesis. Make sure to use actual data (both qualitative and quantitative) and the results of your statistical tests to do so. Finally, where applicable, suggest further extensions to your experiment that could be done in the future.